Holy Old Man Winter y’all. It is COLD here today!! Typical Texas weather, it was in the 80’s yesterday and today…the 30s. And raining. No likey. No likey at all. I guess I shouldn’t complain too much, though. As much as I don’t like cold weather, it’s nice for it not to be 80 degrees for the holidays. That never feels right. And, the holidays are here y’all, ready or not! This weekend J and I will be celebrating Thanksgiving with his family (then with mine on Thanksgiving Day), and I’m so excited! I’m bringing the desserts. Yep, plural. Four, to be exact. His mom says that’s too much, but I say you can never do too much for family 🙂 Besides, I love to bake so it’s a win-win. I get to use that fabulous double oven and share some sweet treats full of love with the family. That’s what it’s all about, right? Thanksgiving…spending time with family and being thankful for each other and for every day that you have together. But that fancy oven doesn’t just make dessert…it’s been known to churn out some pretty delicious dinners as well. 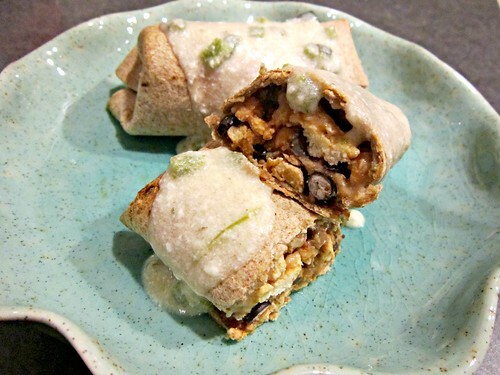 Like these baked chicken burritos, for example. I think ground chicken is severely underused. I only just discovered it in the last year, but I love to cook with it. Meatballs, chicken burgers, these burritos. Yep…healthy and delicious all around. 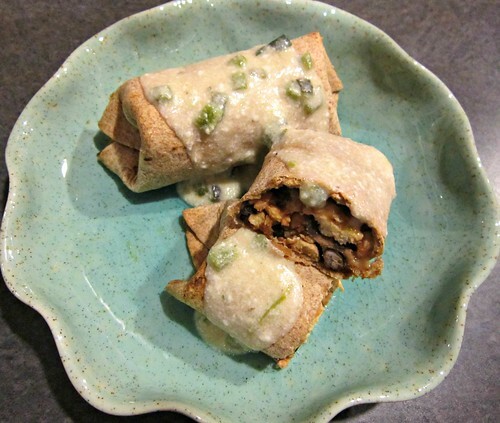 So, what happens when you pair ground chicken, black beans, some great seasonings into a wheat tortilla, bake it until it’s crisp, and then smother it in a creamy poblano sauce? Your taste buds sing, that’s what! Since poblano peppers are fairly mild in flavor and heat, this is a meal that you can share with your whole family, even the little ones!! Preheat the broiler of your oven, and place the poblano peppers on a foil lined baking sheet. Place in the oven and cook for about 5 minutes per side, until charred. Remove to a bowl and cover with plastic wrap while you prepare the burritos. Preheat oven to 400 degrees F and line a baking sheet (or use the same one as you did for the poblanos) with foil, spray with cooking spray, and set aside. Heat a large skillet over medium heat, and then add the oil. Place the ground chicken in the pan and cook, stirring to break up, until well browned. Stir in the garlic and tomato paste and cook for 30-60 seconds, then add in the drained/rinsed beans along with the water or broth, cumin, oregano, chili powder, cayenne, brown sugar and salt, to taste. Reduce heat and simmer until most of the liquid has been absorbed, about 5 minutes. To assemble the burritos, put about 2 tablespoons of the cheese at the end of each tortilla and then spoon some of the chicken mixture over the top. Fold the left and right sides of the tortilla in, and then roll the tortilla up, from the end closest to you, to the top. Place seam-side down on the prepared baking sheet and lightly spray the tops of the burritos with cooking spray. Meanwhile, make the poblano cream sauce. Under cold running water, remove the charred skin, stems and seeds, and dice the peppers. Heat a small sauce pan over medium heat and melt the butter; stir in the flour and cook for an additional minute, stirring constantly. Slowly whisk in the chicken broth and then the diced poblano; continue to simmer, whisking frequently, until thickened. Stir in the yogurt and warm through. Season to taste with salt and pepper. Serve the sauce over the baked burritos. yes. yes I am. Probably this weekend, actually.